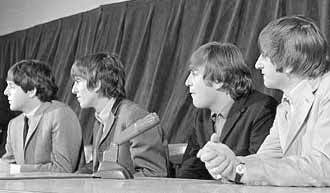 ABOUT THIS PRESS CONFERENCE: Following their performance at the International Amphitheatre in Chicago, the Beatles and their entourage were flown to Detroit Michigan on September 6th 1964, as the 14th stop of their 1964 North American Tour. The Motor City was the place of origin for the music the Beatles had professed to love in almost every interview and press conference -- The Detroit Sound, and the recording artists of the Tamla-Motown label. The Beatles would perform two shows at Olympia Stadium. 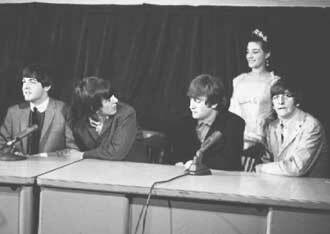 The press conference was held backstage at the Olympia between the two performances. From here, the Beatles would fly from Detroit to Toronto as their 1964 North American Tour pressed onward. 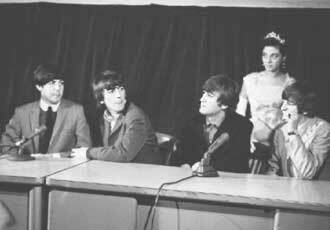 DEREK TAYLOR: (to the press) "If anyone would like to raise their hand." Q: "How do you like Detroit so far?" PAUL: "What we've seen of it." JOHN: "We see very little. The show, we enjoyed." Q: "Is it a disappointment not to see it?" JOHN: "No. We come here to play, not to see, you know." PAUL: "We saw a bit of it though." Q: "Does that noise out there go away with a little bit of cotton packed way deep in your ear so that the noise..."
JOHN: "We're used to it." GEORGE: "We're immune to it." Q: "It doesn't upset your musical balance?" Q: "Which artist or musical group do you think has most influenced your music?" PAUL: "Nicki Cuff, I'd say. No, uhh... American colored groups, mainly. And early Elvis Presley." GEORGE: "In fact, The Detroit Sound." GEORGE: "In fact, yeah. Tamla-Motown artists are our favorites. The Miricles." JOHN: "We like Marvin Gaye." GEORGE: "The Impressions, Marvin Gaye." PAUL & GEORGE: "Mary Wells." JOHN: "To name but eighty." Q: "How many records have the Beatles sold?" JOHN & GEORGE: "We don't know." JOHN: "It's a lot, somebody said." Q: "What part of the film (A Hard Day's Night) did you enjoy making the most?" JOHN & RINGO: "The bit in the field." GEORGE: "And the bit in the bathroom. We had a laugh, didn't we. A laugh. We had a laugh, anyway." Q: "Do the jellybeans bother the Beatles onstage?" PAUL: "It's worse when it's not really jellybeans. When it's... Once there was about 'that long' silver pin that they use for sticking on kilts in Scotland." PAUL: "And it came flying through about two-hundred-mile-an-hour. Just missed me." Q: "Is that an affirmation? Are they throwing it for you or against you?" JOHN: "And when they don't have the sweets they throw whatever they've got on them, which hurts." Q: "Do you ever throw anything back?" JOHN: "I think we did once." Q: "Have you written the new screenplay yet?" JOHN: "No. I'm not writing it. I'm having hard enough time trying to get to sleep." Q: "With the exception of being onstage, after the performances are over do you socialize with each other or do you go your own separate ways?" GEORGE: "Well, we can't go our own..."
Q: "Or is it like in the movie?" JOHN: "It's like in the movie." GEORGE: "We all go the same way, don't we." PAUL: "Especially on tour, you know." PAUL: "It wasn't a joke." GEORGE: (to the others) "Well, they're drunk." PAUL: "Of course it was a joke. Good joke, man." Q: "With the jellybeans, do you think some of the kids should be ejected by the police when they do throw..."
PAUL: "That's stupid, you know." GEORGE: "They should just confiscate the jellybeans at the gate." JOHN: "Or just eat them." PAUL: "Just ask 'em not to throw 'em. Throw streamers instead. We'll have a party." JOHN: "Or balloons, or something light." Q: "What reaction do you guys get individually when you see these kids crying in this hysteria?" JOHN: "I don't know. If you're onstage, you're really thinking about what you're playing, you know." GEORGE: "And it depends how bright the lights are." JOHN: "Sometimes you couldn't see ANYTHING." PAUL: "The overall reaction's just one of being flattered. It's just nice to think that..."
PAUL: "You know, I don't think they're crying because they're unhappy. I hope not, anyway." Q: "Do you guys think of yourselves as singers and romantic idols at the same time?" JOHN: "We're just singers, you know. Or shouters, whatever you like to call it." Q: "What do you think about all the psychologists that are giving..."
Q: "...all these heavy, heavy definitions of what it all means?" GEORGE: "A load of rubbish." JOHN: "They've got nothing else to do, them fellas." Q: "What are some of your talents? For instance, we know singing, we know music, we know writer, we know photography. What else do you do?" JOHN: "I used to paint..."
GEORGE: "Acrobatics. All sorts of things." Q: "Oh, I didn't hear what you said..."
PAUL: (jokingly) "Oh, he's nasty today." Q: "If you had a son, maybe some of you do..."
JOHN: "I have, I have." JOHN: "I've got one like that." Q: "...would you like him to grow up to be a Beatle?" JOHN: "No. What's the point. It'll be all outdated when he grows up." Q: "How long do you think it'll last?" PAUL: "It probably won't last THAT long though, will it?" GEORGE: "I mean, he's 38 now!" Q: "Why did 'World Without Love' go to Peter and Gordon?" JOHN: "Because when Paul and I were fiddlin' 'round it and they heard it, they sang it good. So we gave it to them." Q: "They do a great job." JOHN: "They're good, aren't they. The new one's out, too"
PAUL: "Yeah, the new one." PAUL: "At your local record stores. 'I Don't Want To See You Again.'" DEREK TAYLOR: "'I Don't Want To See You Again,' Peter and Gordon." PAUL: (jokingly) "That's not a plug, though." Q: "Which one's idea was it to let the hair grow long?" JOHN: "We always... We met each other with long hair, didn't we." PAUL: "Well, it wasn't really THIS long, but it was longer than average. It wasn't just an idea that we suddenly got saying, you know, 'Haha, that'll be a gimmick.' In fact, we didn't even know it was a gimmick until somebody told us it was, you know. Somebody kept asking, you know... People from the press said 'What's with the hair?' 'It's like everybody else's, isn't it?' We were a bit stupid in those days." Q: "Who are the fierce competitors of the Beatles?" Q: "Does he still sell that many records?" JOHN: "Yeah, and he does well, him. You know, he's not messing about." Q: "Next to the Beatles, who is your favorite British group?" JOHN & RINGO: "The Stones." PAUL: " And The searchers." Q: "The Animals opened at the Paramount in New York and it was half-empty." JOHN: "Well, you see, nobody knows 'em yet. They'll know 'em. They're good." Q: "When the show is over for the day, and you guys head back to your apartment and houses, do you listen to record albums?" JOHN: "Sometimes. Not very often." Q: "What kind do you listen to?" PAUL: "Or the ones we were talking about before, especially the ones made here in Detroit." Q: "But not (Count) Basie or (George) Shearing?" GEORGE: "I've got a Shearing album, but you've got to be in a good mood to listen to him." PAUL: "We're not very keen jazz fans. We like a bit of all kinds of music." Q: "How about George Gershwin? Jerome Kearn? Cole Porter?" JOHN: "They're okay, you know, but I don't go potty over them." PAUL: "They're great, you know, but we like other things." Q: "Have you had a chance to meet Elvis Presley, and if so, what was his reaction to you?" JOHN: "We haven't met him. We'd like to, you know." GEORGE: "In fact, we met him in a nightclub in London, actually, though I think he never noticed." DEREK TAYLOR: "Can we keep the noise down a bit? Can we have the noise down just a little bit at the back?" Q: "I'd like to direct a question to Ringo. 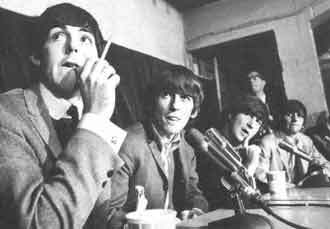 Is it true that you have stated you'd like to be a disc jockey if you were not in the Beatles?" RINGO: "Umm, no. Someone said 'What were you gonna do when it's all finished,' and I said 'I don't know but it'd be good fun being a DJ.' And since then I've become a DJ, only by word of mouth, you know. SO any minute now you'll read, 'Ringo leaves to become a DJ' but it's not true." Q: "Ringo, are you engaged?" RINGO: "No, I'm not engaged. You only have to take somebody out and the marriage is off already, you don't stand a chance." JOHN: (to Ringo) "You don't stand a chance, do ya." Q: "How about you, John, when it's all over... do you have any plans?" JOHN: "No, you know. No plans, no. Why plan?" 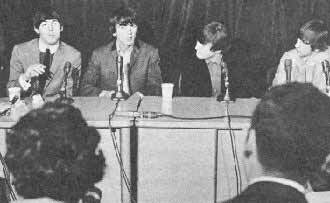 PAUL: "Well, you know, the only thing that really sounds like a plan is that John and I will probably carry on songwriting. But other than that, nobody's made any plans." Q: "Fellas, I know Euorpe soccer is the big sport. Do you have any favorite sport here in America, such as Baseball or American football?" JOHN & RINGO: "We don't like ANY sport." PAUL: "Very unsporting, really. Smoking is a sport." Q: "What do you think of the Dave Clark Five and the Rolling Stones?" RINGO: "Well, the Rolling Stones are good." JOHN: "We just remarked on that. We like the Stones, you know. Dave Clark's alright, but we prefer the Stones." Q: "John, are you working on a new book yet?" Q: "You are? Any idea when it will be out?" JOHN: "Oh no, you know. (giggling) Just, when I finish it." Q: "How do you compare American radio and British radio?" GEORGE: "You can't compare it, really, because in England there's the BBC and then two commercial stations which are outside of Britain... outside of the zone. In America, in each city, they have about thirty. So you can't compare it." RINGO: "It's much better over here." JOHN: "It's more fun over here, though, the radio." PAUL: "It's more exciting, the radio here."